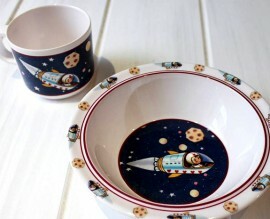 Spaceboy children's bowl - spacekids - space toys, dressing up costumes, kids spacesuits, astronaut food, cool space stuff! Spaceboy retro rocketship design childrens melamine bowl. Dishwasher safe, not for microwave use. Matching cup is available separately.